If you need to seat more than 8 people, Lazy Susan has large garden tables available in a contemporary style. Our 10+ seater modern garden tables look sleek and sophisticated, whilst enabling you to seat a large number of guests. The tables in this range are extending tables, making it easier to seat 10 or more people and still save space on your patio or lawn. These modern garden furniture sets combine a cast aluminium body with a tough glass table top. The chairs are made from aluminium and a hard-wearing outdoor mesh fabric. This makes our modern garden tables and chairs weatherproof and virtually maintenance free. All you need to keep your modern garden furniture set looking great is a clean, damp cloth for the aluminium body, and a squirt of standard glass cleaner for the table top. Take a look at the Violet table if you’re interested in an elegant black modern garden table. The Violet table looks particularly sleek in all black, and extends to seat 10 people. This wonderful modern extendable garden table is also available in grey, white and grey, and white and champagne. If you’re having trouble deciding on a colour, order a sample or two to give you a better idea. In case you’re wondering our modern 6 seater and 8 seater garden tables are extendable, too. Once you’ve chosen the colour, complete your modern garden table and chairs set with the right seating. 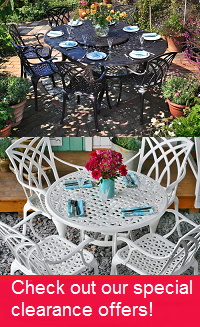 Choose from a number of chairs to combine with your 10 seater garden table. The Milly chair is the default chair that comes with our modern 10 seaters, but note that you can choose this chair in either plain black, or black and grey. For £5 and £15 per chair respectively, the Georgia and the Abigail chairs are alternatives in slightly different styles. All of these chairs are stackable, which makes storing them when they’re not needed simple. Don’t forget to take advantage of our amazing offers before moving on to the checkout page. We’ll give you fabulous discounts for all sorts of garden furniture pieces when you’re purchasing one of our furniture sets. Get up to 70% off of a sun lounger, bistro table or a garden bench to go with your new modern metal garden furniture. If you’re looking for a bargain, take a look at our clearance page, too. There are fantastic deals to be had on everything from sun loungers to 10 seaters, and the deals you find here won’t be repeated. The benefit of using cast aluminium as the main material for our modern garden furniture is that aluminium doesn’t rust or rot. This gives it a distinct advantage over wooden or cast iron furniture. Our garden furniture is designed to last, and as such is a smart and cost-effective choice, since you won’t need to buy furniture covers, sandpaper, varnish or oil for maintenance. If at some point you do notice a small scratch or minor damage to the paintwork, get in touch with us and ask for a pot of touch up paint. We’ll send you one for free. We offer free delivery for our modern aluminium garden furniture, so you have no need to worry about any additional charges once you’re on the checkout page. Our 10 seater garden table sets are delivered on wooden pallets by our partner couriers Geodis. They offer online tracking of your order from the day of dispatch. They’ll also call you the day before delivery to arrange delivery during a time slot that works for you. For more details about delivery you can have a look at our delivery information page or give us a call. For other questions about our contemporary outdoor furniture, our friendly team is on hand from 08:00 to 18:00 daily either to take your calls or answer your emails. Call us on 01243 717107 or email us at [email protected]. We try to answer emails within 2 hours during office hours.